Given a photo of the Moon, taken from Earth, is it possible to calculate the position (Earth longitude and latitude) of the photographer's site? I assume the photo shows enough detailed features like recognizable craters and maria. Is there any software capable of solving the problem? D is the (average) distance from the center of the Moon to the center of the Earth. P is the photographer site on the surface of the Earth. In theory, I think that it might be possible to get a rough estimate (but probably not any closer that +/- a few hundred miles) if you know the exact date and time the image was taken. You could do even better if you had stars in the background that you could see in the image (which isn't going to be very likely as the Moon is so bright and the exposure times are going to be too short to capture stars). In practice, I think it would be very, very difficult. Here is how it would work. At any given time the Moon is presenting a certain face to the Earth and Sun. This is different for any given day an time because of the elipticity and inclination of the Earth's orbit around the Sun and the Moon's orbit around the Earth and the rotational speed of the Moon. This is called 'libration' (see BradC's answer). Over the course of time we can actually see about 59% of the lunar surface due to these variations. So first you have to know exactly what portion of the Moon's face is towards the Earth when the picture was taken, no small feat in itself. As a reference you would use the image you would see if you were at the sub-lunar point on the Earth. This is the point on the earth directly between the Moon and the Earth at the time of the photograph. The location of this point also depends on the time and day of the photograph. From there look for what part of the moon is visible in the photograph. If the photograph was taken from a point south of the sub-lunar point, you'll see a bit more of the south pole of the Moon. Conversely if it was taken from north of the sub-lunar point you'll see a bit more of the north polar regions. You then do the same thing for the east (or west depending of the phase) limb of the moon that you can see. These variations are going to be very, very small. Depending on how much "around the limb" you can see in each direction, this gives you an offset from the sub-lunar point from which you can determine the position of the photographer. The amount of "extra" moon you can see is going to be very small and the best accuracy you can achieve will probably depend on the resolution of the image. Higher resolution images will give you better results. I have no idea how accurate it would be that that would be the method to do the calculation. Now if you had stars in the image as well as the Moon, you could do even better. Given a good sky atlas and the date and time of the observation, you could match up the starfield behind the Moon. Again depending on the resolution of the image and how accurately you could measure stellar positions, you could then determine where on the Earth you would have to be at that time to have the Moon exactly in that position relative to the background stars. If you moved a little in any direction, the Moon would move relative to the background stars so this would constrain you quite a bit. I don't know of any programs that would do this for you. The information exists, and you could work it out, but it might be easier to just send the photographer an e-mail and ask them where they were when they took the picture. :) That would probably be more accurate in any case. I assume that you're assuming that the angle from different parts of the earth would be slightly different? That might be true, but its too slight to use as a reliable measure. Here is an accurate picture of the distance between the earth and moon. Any measurable difference in angle would also be totally eclipsed (no pun intended) by the amount of "libration" (wobbling) that the moon does. At the equator the dark side of the Moon grows down whereas by the poles it grows to either left or right. That's because, when you are at the opposite side of the planet, you are standing upside down. So the direction of the darkness can tell you how far north/south you are. Regarding east and west. At any given time, the Moon is supposed to be at a specific location. If you know exactly how far east/west it is appearing and the exact time then you can deduce your east/west location. The stars behind the Moon could of course yield that information. So the answer is.. yes. The question is, to what level of accuracy can that be done with todays devices? It would be kind of cool to have a device with which you can just take a photo of the moon and from that get your GPS coordinates. It might be useful in wartime when you might have to work without satellites, and when colonizing new planets. One day, this ability will be here. This is a great question to tie in the quest to determine longitude as a driver of astronomy. Briefly, your question is exactly in line with the thinking of any number of ambitious 18th century scientists, inventors, and natural philosophers. And @BradC's fantastic movie of the libration of the moon gives an idea of exactly how frustrating nature can be. Another way of visualizing the complexity is this IDL source code -- and even that is only accurate within a few arc-seconds, which isn't going to help you avoid any reefs. 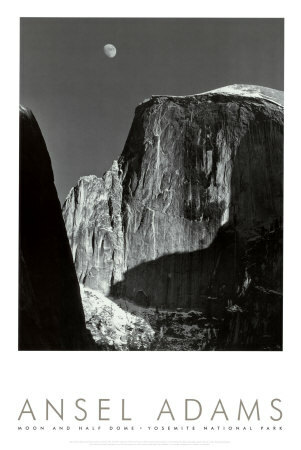 Astronomers at Texas State University were able to determine the exact location and time of Ansel Adams famous moonrise over halfdome picture as reported in a press release issued by the university and Sky and Telescope magazine. A number of people visited the site to reproduce the image a short time later. S&T also published an article explaining how they worked out the time and location but I'm unable to find it. After consulting lunar tables, topographic maps, weather records, and astronomical software, the Texas State researchers determined that Adams created Autumn Moon on Sept. 15, 1948, at 7:03 p.m. Pacific Daylight Time. Earlier this year I had a chance to take a photo of the "blood moon" - the eclipse of September 27, 2015. I used an "ordinary" camera: a Panasonic FZ200 with 25x optical zoom, without a tripod but with image stabilization. When I looked at the pictures on a big screen, I noticed a few little dots in the background which I initially assumed to be noise (or defective pixels). But then I pulled up the "Sky Guide" app for that time and location, and discovered that I actually had accidentally found some faint stars that were visible because the moon was so dim. On the left you see the image from the Sky Guide app (I had to rotate it slightly to align with my picture) and on the right, the photograph I took. The intersections of the two sets of lines through the most visible stars falls just inside the disk of the moon. I circled the stars in my photo because they are quite faint. 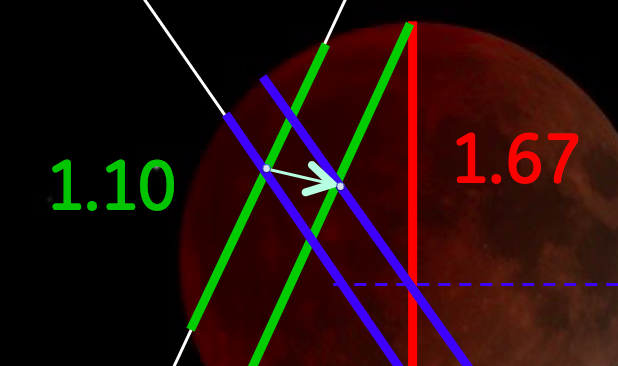 The dimensions given are in inches on the screen: the diameter of the moon is 1.67", and the two green lines are 1.10" and 1.46" respectively. Since these lines intersect the edge of the lunar disk at a fairly acute angle, we can estimate their distance quite accurately from these measurements. Unfortunately, for the other direction the lines are quite close to the center of the disk, so it is less easy to measure their distance accurately. However, we can use the line of intersection of the vertical diameter and the diagonal to get "somewhat close". This displacement is approximately 0.25", or 15% of the diameter of the lunar disk. 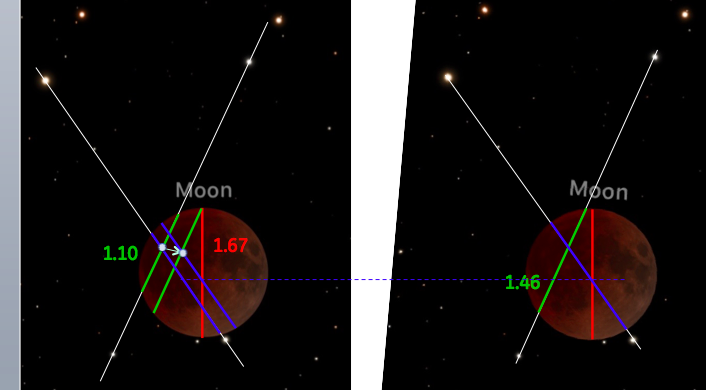 Since the moon subtends an angle of approximately 0.5° relative to Earth, this means that the angular displacement of the two points relative to the moon is about 15% of that, or 1.3 mrad. We can now estimate the distance between these two points - it should be the distance from the surface of the Earth to the moon, multiplied by that angle. If we say the moon is about 400,000 km away, then we get a distance of 500 km. That's about 60% bigger than the actual distance of 300 km; this shows that it's hard to get an accurate measurement using only the tools you specified. Note also that the moon and stars move across the sky pretty rapidly: to cover 360 degrees in 24 hours or 15 degrees per hour, it moves about one lunar diameter every four minutes. This means that you need to know the time of the photograph quite accurately if you want to estimate the position of the camera - the error I had above (200 km) corresponds to about 40 seconds (google "the problem of longitude" - this has bothered seafaring nations until the advent of GPS). 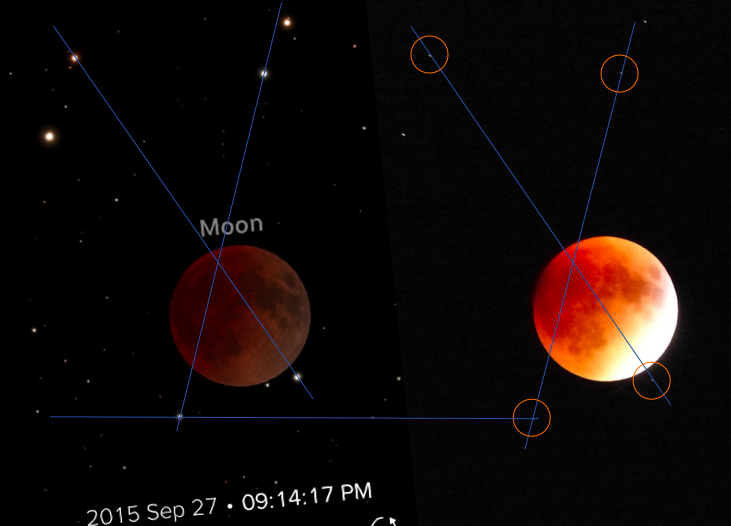 I had the benefit of using software that could observe the moon "at the same time" at two different locations - usually life isn't that accommodating. So - assuming that you have an accurate clock, and take the photo of the moon at the time of a total eclipse so you can observe near-by stars, a hand held camera can get your position to within 100 miles or so. Note that I am assuming you can't do a good measurement of the angle of the moon relative to the horizon (the usual trick with a sextant... it uses mirrors to project the image of the moon onto the horizon for an accurate measurement. If you try to do that with a camera, the angle will usually be too large to be measured accurately, unless the moon is really close to the horizon). Not the answer you're looking for? Browse other questions tagged astronomy astrometrics or ask your own question. Is there any evidence for the claim that the moon was once part of the Earth? Could the earth have another moon? The Moon is slowly moving away from the earth. Does this mean that a total solar eclipse wasn't possible at some point in earth's history? When Venus is the brightest when viewed from Earth? Can you explain in mathematical term of how the moon makes the earth spin stable? How do I compute the galactic cooridinates of the Earth for a given date? Can we calculate the point on Earth nearest to the Moon? Why can we see the moon when it is between the Earth and the Sun?